AND IT WANTS YOU ON STAGE AT BAD!SLAM!NO!BISCUIT! IN THE SMITHS ALTERNATIVE! BAD!SLAM!NO!BISCUIT! WANTS YOU TO BE THE AUDIENCE IN THE SMITHS ALTERNATIVE! And because it wants your words and your claps and your jeers it provides a stage, two minutes, an audience, two microphones, five judges, a sound system, The Sound Guy, two MCs, The Master of Conflict and The Score Adder and The Sacrificial Poet, all for your words all for your original words, all for the giving of prizes, all for the giving of the glory, all because it is the Friday night. Now, because this is the poetry slam in the Smiths Alternative on the Friday night at the 8:30pm (no earlier because you’ll be chased by the broom of theatre) we also bring to you Hayley Shone! YES, THAT’S RIGHT! HAYLEY SHONE! 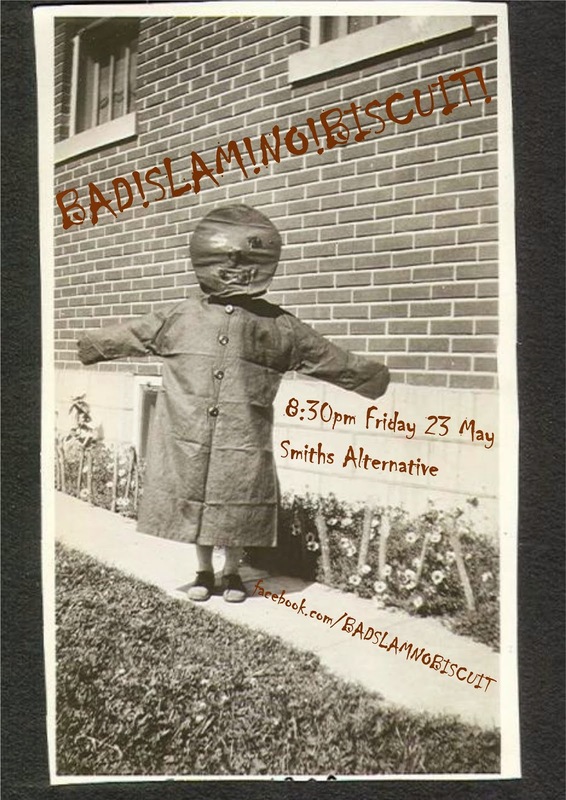 And because we are in Smiths Alternative on a Friday night we also need a house band and that house band will be the BAD!SLAM!NO!BISCUIT! house band The Brass Knuckle Brass Band. "THE BRASS KNUCKLE BRASS BAND is a New Orleans style street funk group from Canberra. BKBB has performed to great acclaim and significant booty shaking at the Falls Festival, Corinbank Festival, the Snowy Mountains Music Festival, the National Folk Festival and most rooms in the ACT large enough to fit six horns and percussion. The band has also had the pleasure of sharing bills with a bunch of amazing funk and soul artists including Clairy Browne and the Bangin’ Rackettes, Saskwatch, the Cactus Channel and international trombone deity and James Brown sideman Fred Wesley." And filling the Hadley Memorial Slots is JASON ANDREWS. His name is not normally all in capitals letters but from this time onward it will be. LONG LIVE THE HADLEY MEMORIAL SLOTS AND MAY HADLEY REST IN PEACE! So join BAD!SLAM!NO!BISCUIT! at Smiths Alternative at 8:30pm for the Poetry Slam on the Friday night. And remember no props, no music, and your original words, poetry slamming starts at 9pm.